Here’s my 2018 book list! Every year I put together a list of the books I hope to read in the coming year. Regardless of whether I make it through the whole list or not, I love the challenge! 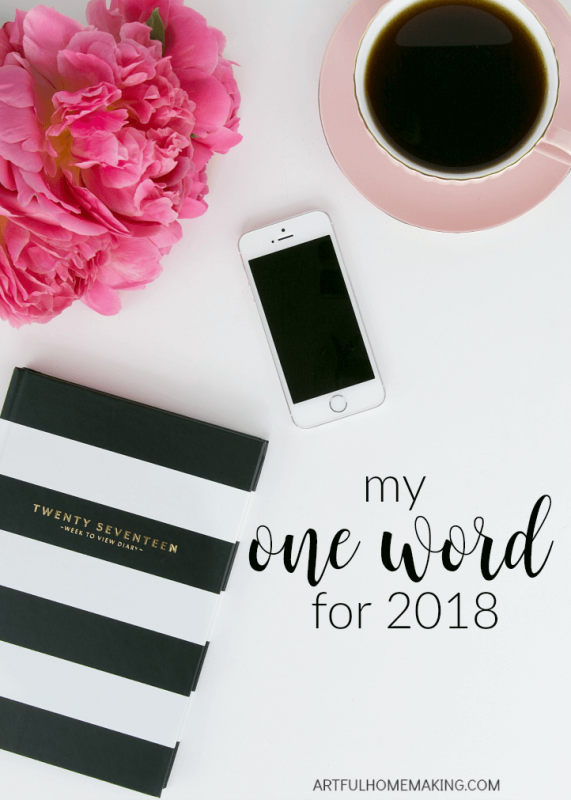 Yesterday I shared my one word for 2018, and today I’m sharing my 2018 book list. You can find last year’s book list here. As usual, some of the books on my list I’ve read before, and others are completely new to me. The topics range from biblical womanhood to parenting to health. Some of these books were already on my shelf (some we’ve had for years), others I received from family members as Christmas gifts, and some were found at used bookstores. Margin, Richard A. Swenson, M.D. So, those are the main titles on my 2018 book list! I usually try to keep my reading list to a manageable size, and I don’t always finish all of them. What often happens is I end up adding more books and then some of the ones I’m less-interested in sort of drop off the list or I’ll add them to next year’s list. Since there are a little over 24 books on the list, if I can read at least 2 books per month I might make it! Usually I get more reading done in the winter months since we spend more time inside. 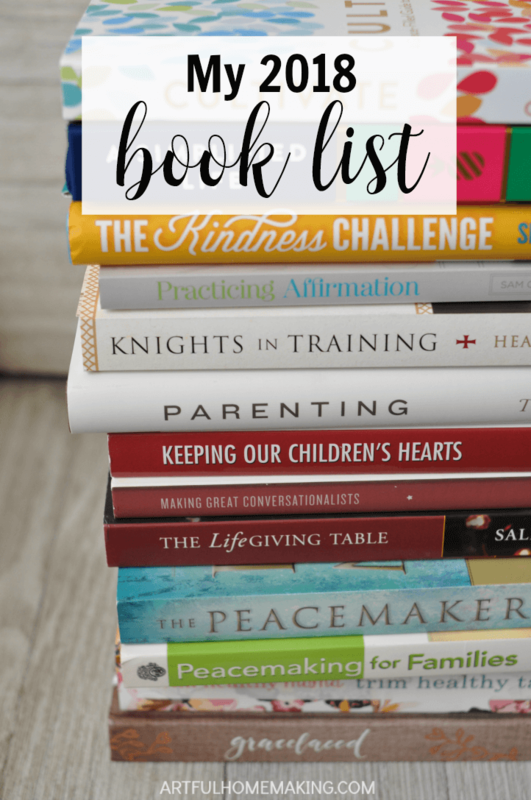 Almost every year I include lots of motherhood books and homemaking books on my list. This year was no exception. Except that I have more parenting books than home-focused ones this year. I try to choose books that will be encouraging and challenging. 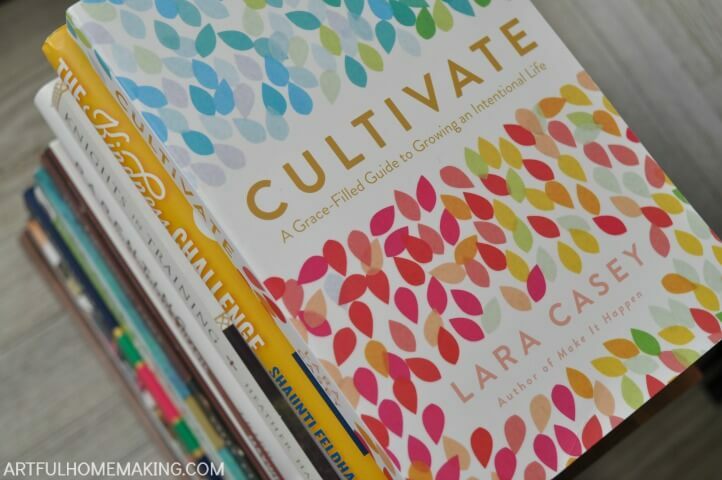 Books that will help me reach my goals as a wife, mother, and homemaker. What are you reading this year? Have you read any of the books on my list? Disclosure: This post includes affiliate links. Read my full disclosure here. Sharing here. Sally’s books are among my very favorites! I just finished Life Giving Table last month—so good! So many book, so little time! I always have a list of books as long as my arm… and I honestly have a hard time ever getting through them. Reading is (right now) not one of my favorite things to do. I don’t like it. I used to be a big reader. I’ll have to find that top one and add it to my list, for sure. There are a couple of your list that I own and are wanting to read soon or have read… years back. So tell me. What is your system for reading. One or two books a month? I finished the Cultivate book (the one on the top of the pile) last week. Loved it! And, I’ve already crossed 4 books off my list this month! Usually I aim for two, but sometimes I can’t get much reading in. Lately I’ve had more time for reading since we’ve had quite a bit of sickness going around. Last year I read a lot of books while waiting for my kids at piano and gymnastics lessons. So that helps. I also have scheduled reading time in the morning after my Bible reading/prayer time. looks like a great list! Thanks for sharing on Homestead Blog Hop! This looks like a fantastic list! The “12 Ways Your Phone is Changing You” sounds very interesting and probably a little alarming! Thank you for sharing your list with us at Party in Your PJ’s. Wow, great list! I read Sally Clarkson’s book and it was terrific! I’m putting together a parenting class, and had forgotten to include it in my resources list, so thanks for this reminder! Thanks, Michele! I can’t wait to read Sally’s book! I know how that is—I never get to every single book on my list! 🙂 So glad you stopped by, Amy! Thanks so much for stopping by, Kristin! Thank you for your beautiful blog ! Happy New Year from the bottom of my heart ! How kind of you, Franca! Thank you very much, and I hope you have a lovely New Year!